The movement to enact commonsense gun legislation can be exhausting. It feels like no matter how much death the country sees, the Republicans and the NRA are committed to holding back even the most modest reforms. However, it’s critical to remember that the NRA is an extremist group advocating policies out of step with Americans. One of these measures is to enact a “red flag” law, which allow courts to temporarily remove firearms from the homes of individuals who are deemed to pose a risk to themselves or other. 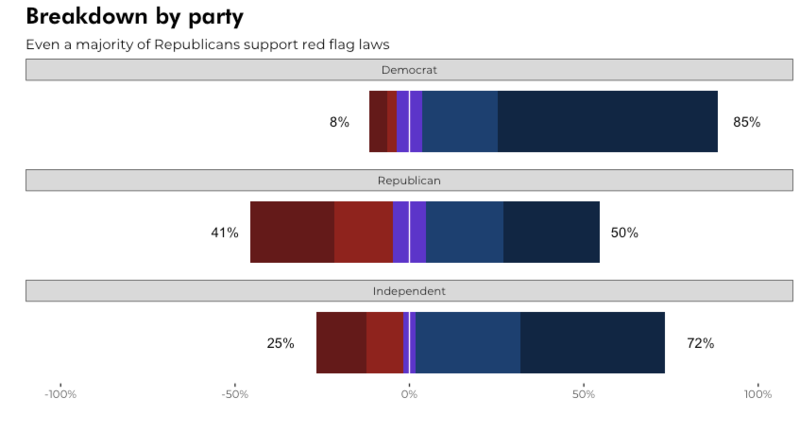 From January 25 to 29, 2019, Data for Progress fielded a survey of 1,282 nationally representative voters with YouGov Blue about red flag laws. (Un)surprisingly, the American public does not view these topics as controversial as Twitter pundits would have you believe. Seven percent of respondents were not sure about their view on red flag laws, and we exclude those respondents for this analysis. A full 69 percent of respondents support red flag laws. This finding is another example in the long history of progressive (and common sense) gun laws polling extremely well. Support for the progressive position goes to the right of the y-axis, and support for the conservative position goes left. Percentage labels are the values for each blue and red area (thus, do not add up to 100%). This finding is remarkably consistent across all age groups, with the Silent Generation and Baby Boomers less than 10 percentage less likely to support red flag laws as Gen Xers and Millennials. This narrative remains true when looking at the data by race. African-Americans support red flags laws in greater numbers than other racial groups, but there is no outlier on the other side where support is unusually low. Finally, we see there is a large difference in the opinions of Republicans vs. others. However, even a majority of Republicans support red flag laws. Despite the lack of media discussion, “taboo” policies, including red flag laws, have strong support with the potential to go much higher. This flies in the face of the conventional wisdom that progressive candidates running on progressivism will doom us all. Brandon Williams (@bmwilly) is a data scientist and patzer living in Berlin. Colin Bowers (@colinsonofroy) is a data scientist and engineer with an interest in advancing progressive causes, especially those related to the environment, international affairs, and social justice. Data and code for this post can be found here.